Naoki Urasawa is regarded as one of the premier manga creators, and 20th Century Boys is one of his crowning works. It has won multiple accolades, including the 2001 Kodansha Manga Award, an Excellence Prize at the 2002 Japan Media Arts Festival, and the 2003 Shogakukan Manga Award. This volume introduces the story in twin narratives. In 1969 a group of boys create a club, complete with a hideout in a field and a secret symbol to help them identify membership. 30 years later, this symbol resurfaces as part of a secret society headed by a mysterious figure only known as "The Friend." This group seems to be involved in shady dealings, murdering rivals, and manipulating social control. Also, they seem to be bent on destroying the world with a giant destructive robot reminiscent of Gigantor. A friend's suicide leads failed-rocker-turned-convenience-store-owner Kenji Endō to try piecing together what's going on in the present with his hazy memories of the past. The story and art both contain clues to the mystery, and Urasawa spins a compelling story that bears (even requires) rereading because of its nuances. The title of the series comes from a famous single by the glam rock band T. Rex, and there are many references to rock music and the popular culture of the times. In Japan, this series was hugely popular, and it has spawned a trilogy of ambitious live action movies. The movies deviate from the books in some ways; still, some may wish to avoid the trailer because of spoilers. US reviewers have been very positive about the book. Lee Newman praises it, stating that "Urasawa has converted this conservative American fanboy" to manga. Hansel Castro literally runs out of superlatives describing it. Greg McElhatton is impressed by the level of detail in Urasawa's story and art. 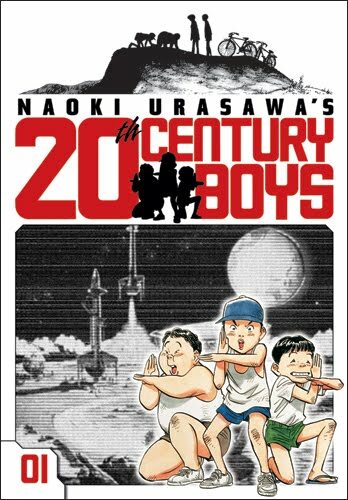 20th Century Boys is published in the US by VIZ Media. 13 of the intended 22 volumes have been published. The series was delayed until his other series Monster and Pluto were completed, and the remaining volumes are again being released periodically. 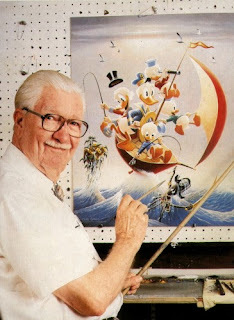 Company owned comic books did not always credit individual creators, but Carl Barks became one of the first to become well known. He began working for Disney in 1935 as an inbetweener, drawing the scenes showing movement between the key poses drawn by animators. In the 1940s he moonlighted as a comics artist, specializing in Donald Duck stories. Over time people began to recognize his style whether in comedies or imaginative adventure stories, and he came to be known as "The Good Duck Artist." It was not until 1960 that his name appeared in the comics and he became generally known. Although he "retired" in the 1960s, Carl Barks worked on duck comics for 30 more years. He created a vast array of characters, notably Scrooge McDuck, the Beagle Boys, the Junior Woodchucks, Gyro Gearloose, and Gladstone Gander. An encyclopedic list of all the Disney comics Barks worked on is here. An international superstar whose work has been enjoyed by millions upon millions, Barks was among the inaugural class inducted into the Will Eisner Comic Book Hall of Fame. Showing just how far-reaching his influence has been, an asteroid was named after him by a scientist he inspired with his stories. 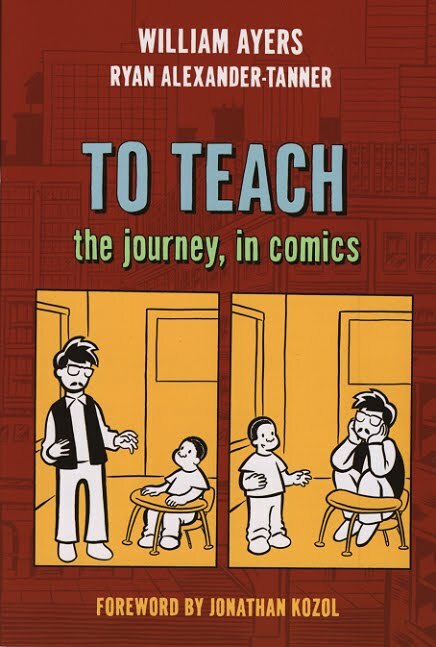 A companion piece to the memoir To Teach: The Journey of a Teacher, this graphic novel portrays a very student-centered view of education and offers insight into setting up an interactive, supportive, and relevant classroom. Starting with kindergarten students, the point here is to use real world situations for learning experiences as well as to honor students' backgrounds and knowledge. Along the way, there is commentary about standardized tests, what's important in a curriculum, and the roles of teachers in creating pedagogy. The clean, expressive art lighten up what could be seen as a didactic tone. To Teach was written by Bill Ayers, an activist, distinguished professor, and Senior University Scholar at the University of Illinois at Chicago. He has had a long career writing about social justice and promoting democracy through education. Before he got into education, he was involved with the radical Weather Underground Organization that claimed responsibility for a dozen bombings between 1970 and 1974. This association recently came to the fore as a lightning rod for criticism toward Barack Obama, who had received a $200 campaign donation from Ayers. The art, a combination of cartoon and realism, was provided by Ryan Alexander-Tanner, an art teacher from Brooklyn. 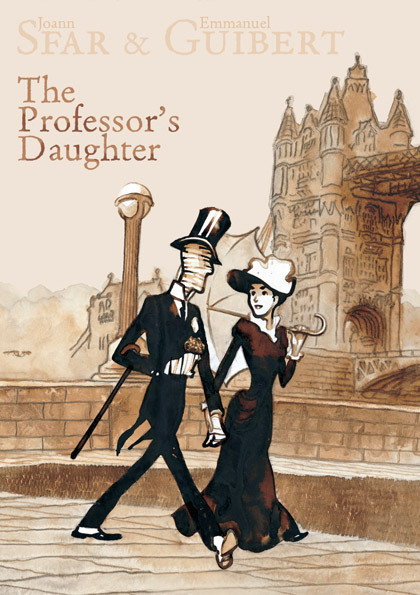 He is a past winner of a Xeric Grant for his comics work, and this was his first graphic novel. Alexander-Tanner talks about his work in this interview at The Daily Cross Hatch and this one at the Graphic Novel Reporter. He and Ayers speak about their work here in this video from The Carnegie Foundation as well as this interview at SMITH Magazine. 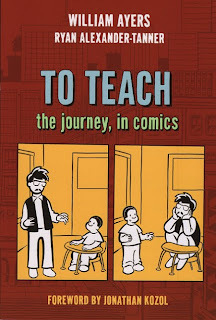 This graphic novel version of To Teach has been mostly well reviewed. Angela Leeper praised this book, writing that "this new version of To Teach will continue to inspire teachers for generations to come." Jessica Restaino called it "a restless, eager, anxious work, one that points menacingly at the big picture while it also celebrates the “smallest” triumphs, one student and one teacher at a time." Kerri Arsenault offers a contrary opinion, that "the book suffers from an overabundance of words and lack of constructive illustrations, and the incontrovertible rhetoric makes the book feel pedantic, rather than salient, obfuscating its original intent." This book clearly elicits strong responses to its message. An excerpt, video preview, reviews, and additional information can be found here from the book's publisher Teachers College Press. One of the most acclaimed graphic novels of 2009, Asterios Polyp is a beautiful, moving exercise in graphic storytelling. The story literally starts with a bang, as a lightning bolt strikes Asterios's apartment building and burns it to the ground. He gathers three items before he flees, a lighter, a Swiss Army knife, and a wristwatch. Bound by nothing, he uses what little money he has left to buy a bus ticket as far out of town as he can get. The rest of the narrative cuts between his past and his present, detailing his marriage, his childhood, his divorce, his attempts to reinvent himself as a mechanic, his self-absorbed behavior as a professor, and his repeated need to look at the word in binaries. 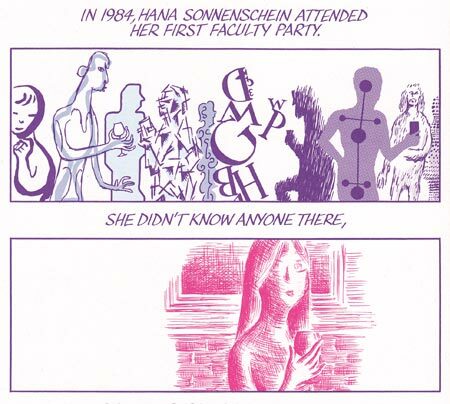 As he writes in his bio, Mazzucchelli has been drawing comics his whole life. He began his career with very notable collaborations with Frank Miller on Batman and Daredevil, but he has worked on creator-owned works such as Rubber Blanket as well as a graphic adaptation of Paul Auster's novel City of Glass. This is his first graphic novel. This interview details much information about his career, focusing on specific works as well as his craft as a whole. 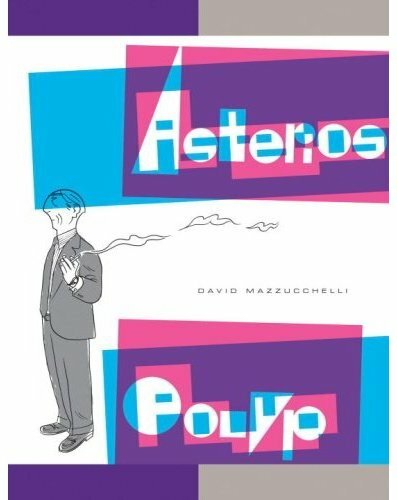 Asterios Polyp is a highly regarded book that won the Reuben, Harvey, and Eisner Awards for Best Original Graphic Novel. It also won a coveted Grand Jury Prize at the Angoulême International Comics Festival. Douglas Wolk wrote in his New York Times Book Review that the book was “a dazzling, expertly constructed entertainment, even as it’s maddening and even suffocating at times." New York Magazine's Dan Kois appreciates that Mazzucchelli created a book that reads like a great graphic novel and not "like a treatment for a future movie deal." Entertainment Weekly's Sean Howe called it "sprawling, trippy, moving, and a hell of a lot of fun." This book was published by Pantheon Books. A 8-page preview is available here from New York Magazine. This tale of friendship, loss, and forgiveness is simple and moving. 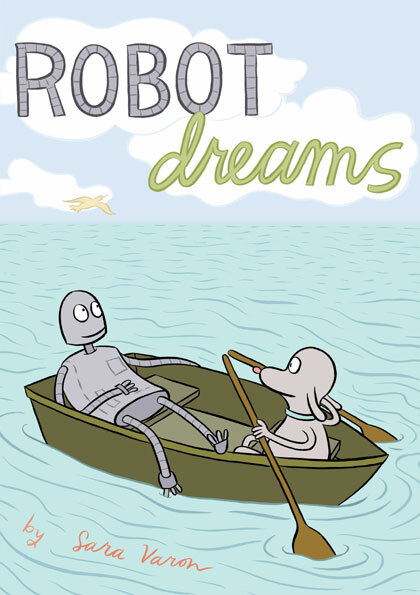 A dog decides to buy and build a robot as a companion, and the pair have a great time until an ill-advised swim leaves the robot rusty and immobile. The dog is forced to leave his friend at the beach but when he goes back to fix and rescue him, he finds himself cut off. The rest of the book details the events that happen during the following year, with the dog and robot following different paths. This remarkable book is the work of Sara Varon, a New York-based artist who has written other graphic novels including Cat and Chicken and Sweaterweather. Her work tends to be geared toward younger readers, with simple, strong illustrations and little if no words. But her works can be enjoyed by readers of any age. She is able to convey many details through her art, and Robot Dreams in particular conveys an compelling narrative containing many emotional beats. This book has amassed many accolades including being named a Kirkus Best Book of the Year, a Publishers Weekly Best Book of the Year, an Young Adult Library Services Association Great Graphic Novel, and an Association for Library Service to Children Notable Children's Book. Reviewer em at Love YA Lit wrote that "Varon’s choice of adventures for her characters (in dreams and in reality) are quite imaginative and make the emotional journey fun, safe, and inviting." Less officially, teen-aged reviewer Funky Alpaca Trey W. called it "the most emotional picture book I have ever read." A preview is available here from the book's publisher First Second. 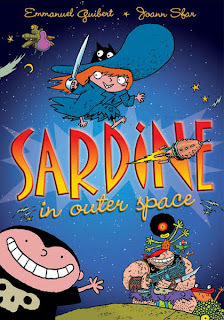 Another collaborative work from French graphic novelists Emmanuel Guibert and Joann Sfar, Sardine in Outer Space is the story of a little girl, Sardine, who is the most dangerous disobedient child in the universe. She is a member of a space pirate crew that includes her uncle Captain Yellow Shoulder, her cousin Little Louie, and her cat. The foursome travels through space having wild episodic adventures, dodging the authorities, visiting a galactic ice cream shop, shopping at a toy store, and escaping from a giant one-eyed, four legged beast. The chief target of her actions is Supermuscleman, the "chief executive dictator of the universe," who looks like a mustachioed Captain Marvel--the Shazam! version--only without a cape. Supermuscleman is a tyrant who works with a mad scientist alien Doc Krok to capture Sardine, and it drives him crazy that this little girl constantly gets the better of him. Guibert writes the stories here, and Sfar provides the art. Individually they have won multiple international awards for their works. For those inclined to learn more about him, Sfar keeps a blog where he shares his idiosyncratic and sometimes ribald thoughts. 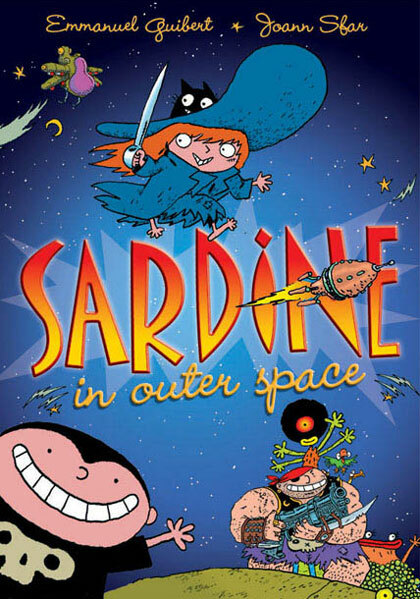 Sardine in Outer Space has been received well. Brian Cronin appreciates that the children in the book are taken seriously as if they were adults and likens it to works by Roald Dahl, particularly Matilda. The Graphic Classroom's Kevin Hodgson appreciates the spunky protagonist and the humorous situations portrayed in the book. Kathleen Karr remarked on the creative use of literary stereotypes to create "clever, meandering plots" sprinkled with sight gags. This is the first of a series of books, of which six are available in English. A preview and other reviews can be found here from the book's publisher First Second. 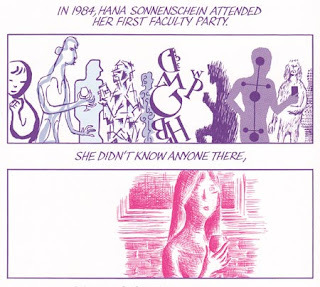 The Comics Journal just went live with a new version of their website, and Patrick Rosenkranz has an informative, comprehensive article there about the history of autobiographical comics, beginning with Justin Green's 1972 work Binky Brown Meets the Holy Virgin Mary and running through such figures as Harvey Pekar, Marjane Satrapi, Chester Brown, Gabrielle Bell, Joe Sacco, and Art Spiegelman. Will Eisner accomplished much in his lifetime. He meshed cinematic techniques with comic books in The Spirit, was a partner in a studio that provided content and characters during the early years of the comic book industry, played a role in training comic creators like Jack Kirby, served his country during World War II, popularized the term graphic novel with his book A Contract with God, and wrote a seminal book on creating comics entitled Comics and Sequential Art. His work and name are commemorated with the Eisner Awards, one of the major industry awards for comics and comics creators, as well as the Google logo above. Eisner, of course, was inducted in the inaugural class of the Eisner Award Hall of Fame in 1987. This fantastical graphic novel was produced by two of France's premier comics creators, Emmanuel Guibert and Joann Sfar. Guibert is an artist capable of many styles who has been involved in writing the Sardine in Outer Space series as well as drawing Didier Lefèvre's The Photographer. The prolific Sfar has written and drawn hundreds of comics and graphic novels, including the acclaimed The Rabbi's Cat and The Little Vampire series. As might be expected when two high caliber talents collaborate, the critics I have read largely celebrate this book. Susan L. Carr draws attention to the many whimsical details the story exposes about Victorian England. Heidi Dolamore from the School Library Journal praised Guibert's art as the best part of this "enjoyable melodrama." Gina Ruiz highly recommends this "bizarre, well told and completely wonderful" tale. Perosnally, I found the book funny, surreal, and slightly dark at times.